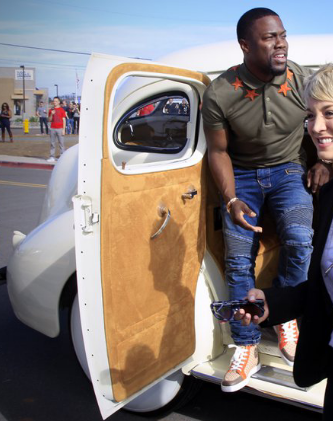 Actor Kevin Hart of the star of his upcoming movie, "The Wedding Ringer," was seen as he arrived at Marine Corps Air Station at Miramar’s Bob Hope Theater for the special the movie's special screening in San Diego, California. 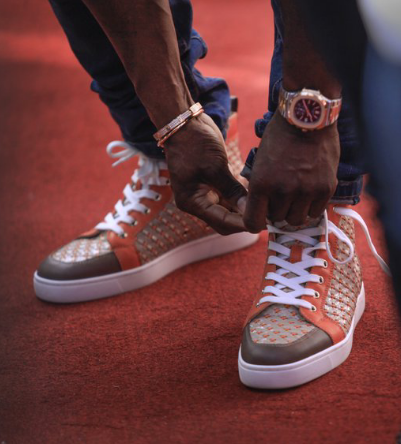 The star comedian wore a Givenchy star embroidered polo shirt on a Balmain biker jeans and then paired up with a Christian Louboutin Rantus Men’s Flat sneakers. Women are not only the lovers and wearers of Christian loubs..i tell you girls guys too also have got soft spots for the unique designer.. I have seen guys that are bad_ss shoe lovers..dayumm..when i see them...chai my high morale becomes low instantly cos the next thing that will be ringing in my head is how will a guy have more shoe than me a girl...it is well. I use to believe that only girls loves shoes and guys ain't gat time for them...my dearies as i started blogging ,looking and searching,i got to realise that mehnn it is a 50/50 thing ooo..
What do you guys think about his look? me i likey plenty..Kevin's gat style no doubt..